Repairing and Replacing RV Roof Vents After a Hail Storm! 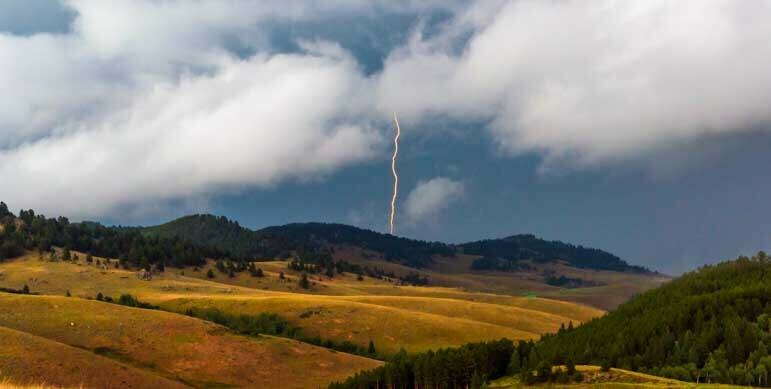 July 2018 – We have been floating around northern Wyoming and the Black Hills of South Dakota for the past few weeks, an area that is prone to wild hail storms. The other day, while we were away from the trailer in town, a horrific hail storm came through our campsite and wreaked havoc on our RV roof. Will these gathering storm clouds dump hail on us? We didn’t know this was happening while we were gallivanting around town, sipping lattes, running errands and chatting with the locals. It was nice there! But we got a hint about what had happened (that we didn’t understand at first) as we drove back to our campsite when we saw a fifth wheel trailer going by us on the highway with a wildly flapping tarp strapped down over its roof. When we got back to our trailer we noticed some large clumps of ice in the grass and began to wonder. At least half an hour or more after the storm ended, big chunks of hail were still on the ground. 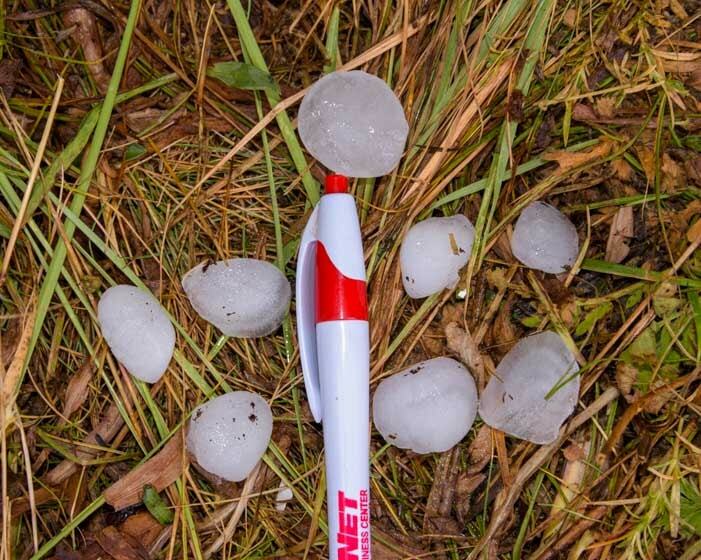 We’ve been through hail storms before, most notably at Bryce Canyon and at Cedar Breaks National Monument, but the hail has always been about the size of a pea. Even at that, the thunderous sound on the trailer roof is astonishing. But this time, considering the storm must have ended at least 30 minutes or even an hour or more before we got back to the trailer (the ground wasn’t very wet), these ice chunks were still pretty big despite melting fast. Suddenly it hit us, “Uh oh. Are the solar panels okay?” Mark quickly climbed up on the roof to find out. As he yelled, “Oh, WOW!” from the rooftop I noticed that another storm was darkening the sky and was on its way. Luckily, there was no damage to our solar panels. However, the hail storm had smashed two of our RV roof vents! 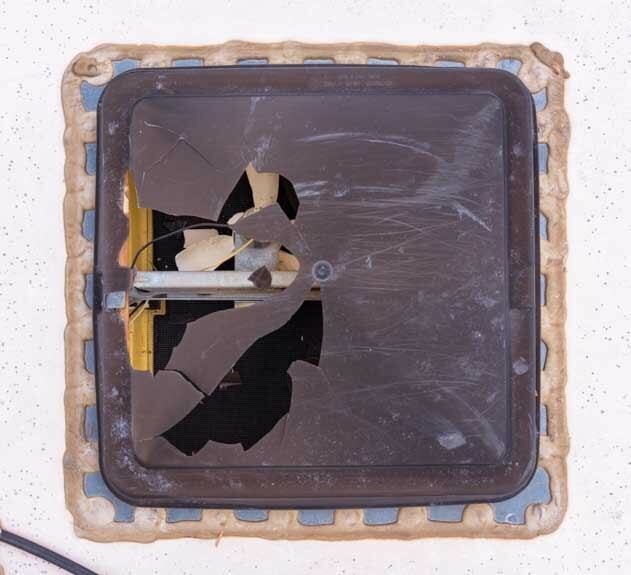 These were basic RV roof vents with small 12 volt fans, one located in the toilet room and one in the shower stall, and the damage to each one was severe. 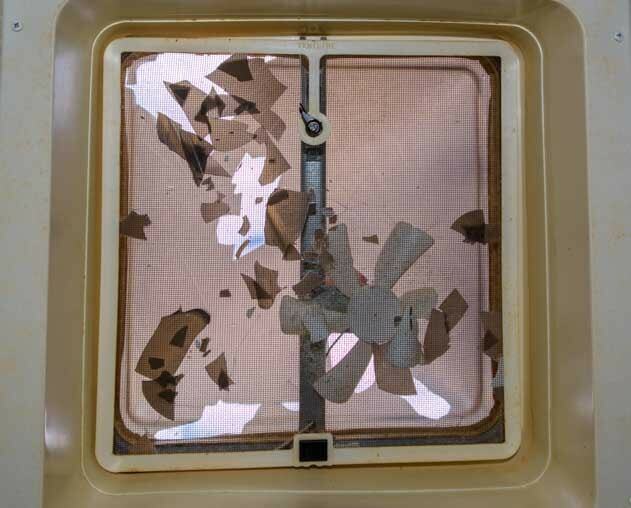 Not only were the RV roof vent dome lids broken in multiple places but the fan blades above the screens had been broken off too! Not only did the lid get broken but some 12 volt fan blades broke too! The other vent fared no better! 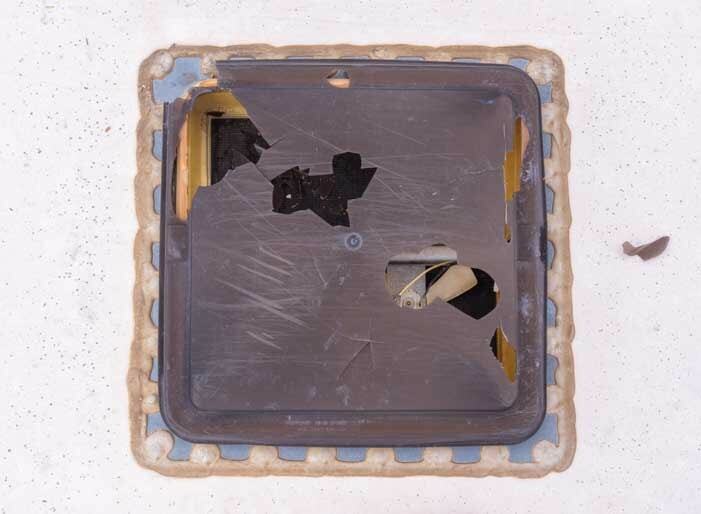 Interestingly, our two Fantastic Fan RV roof vents were still 100% intact and sustained no damage. That’s an especially good thing because they are over our bed and over our recliners which would have all gotten soaked. We had little time to puzzle over it all because another storm was on its way and would be dumping either rain or hail or both on us again momentarily. If we didn’t fix the vents in the next 10 minutes or so, our shower and toilet room would get drenched inside once again. That wouldn’t be a disaster, but who would want to sop up the mess twice? 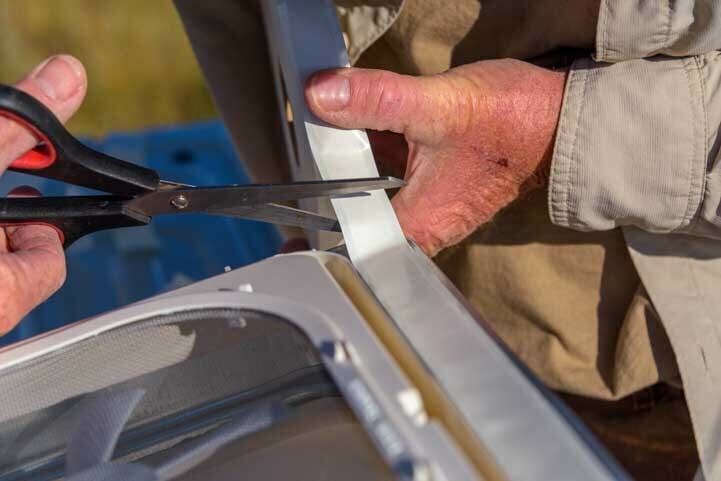 Mark surveyed the damage and decided the best way to fix the RV roof vents for the short term — until we could get some replacement RV roof vents — was to tape them up with Gorilla tape. A quickie repair job with Gorilla Tape was enough to withstand a few more violent storms! The storm arrived with a vengeance and we were pelted with rain. Then another two storms passed over us in the next 12 hours. Not much hail fell, but one storm pounded us with a deluge of rain for over two hours. As I clicked the shutter on this eerie landscape I saw a flash of lightning through the view finder. What luck! Gorilla tape is amazing stuff, and not one drop of water leaked through the broken roof vents in all that rain. So, if you’re ever in a bind like this, it doesn’t hurt to have a roll of Gorilla Tape on hand! We debated whether to file an insurance claim, but the cost of this repair would barely meet our deductible. We also debated whether to try using our RV extended warranty since it had worked so well for us in the past when we needed some truly major equipment replacements (axle, fridge, suspension, toilet and plumbing). But warranties cover system failures, not accidents or acts of God (like hail). So, this would be a DIY job without any outside financial assistance. 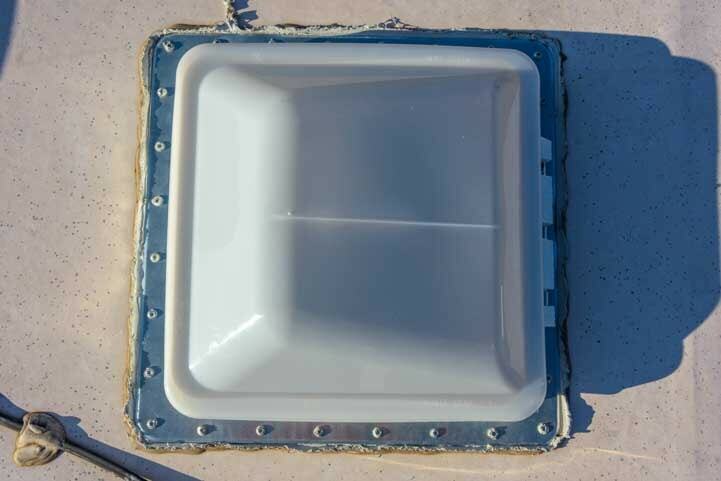 The next day we picked up two replacement RV roof vents (Ventline V2094 units by Dexter) at a local RV dealership and parts store. We didn’t get there until the afternoon, and we were amazed to find that there had been a run on RV roof vents that morning. They had just one left. The other had to be brought in from a partner store in the next town! We also picked up a bunch of tubes of Dicor Lap Sealant, and then Mark got out the tools needed for the job and went to work. 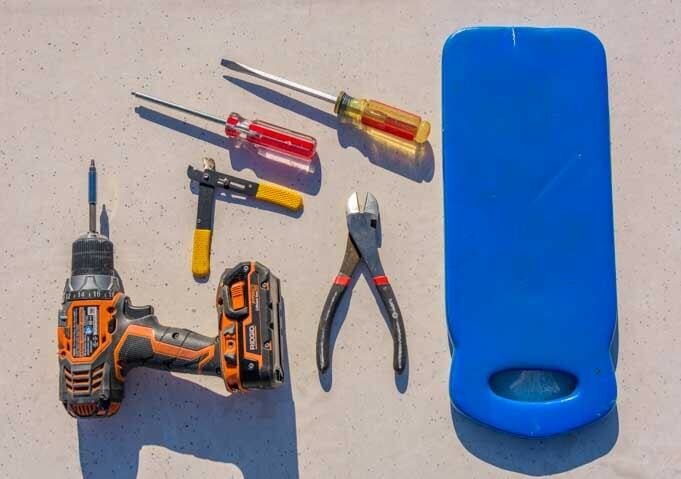 Tools for the job: Screwdrivers, drill, wire cutters and a knee pad. Not shown: a caulk gun. 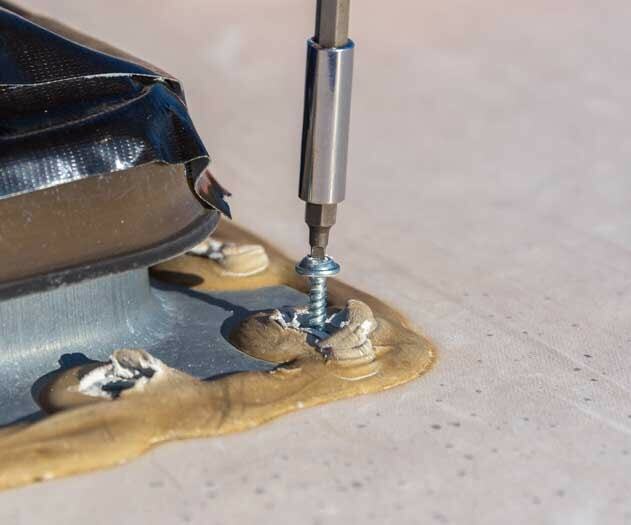 First, he used a flathead screwdriver to get the old Dicor Lap Sealant off of all the screw heads holding the damaged roof vent to the roof of the trailer. First, scrape off the old Dicor Lap Sealant to reveal the screw heads. All the screws are #2 square heads. 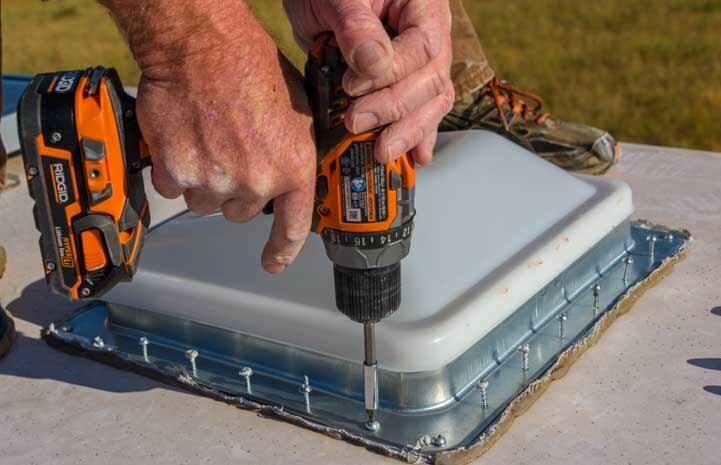 Unscrew the screws using a #2 square drill bit in a cordless drill. Then he used a #2 square bit in our Rigid cordless drill to unscrew all the screws. All the screws have been removed. 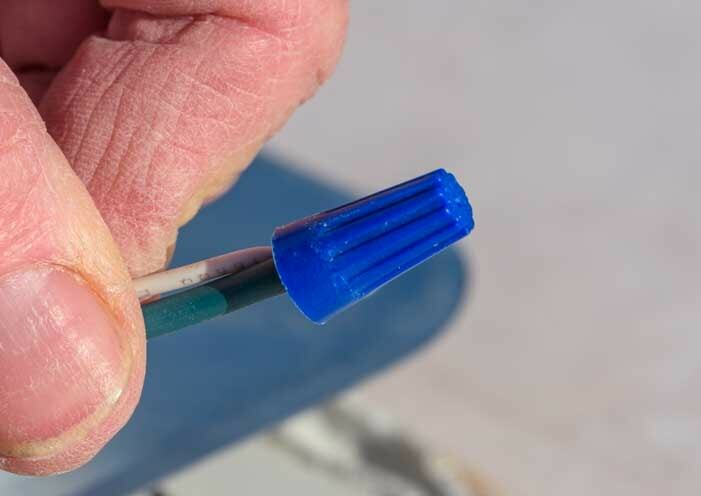 Then he used the flathead screwdriver to remove the Dicor Lap Sealant from the top of the RV roof vent flange. 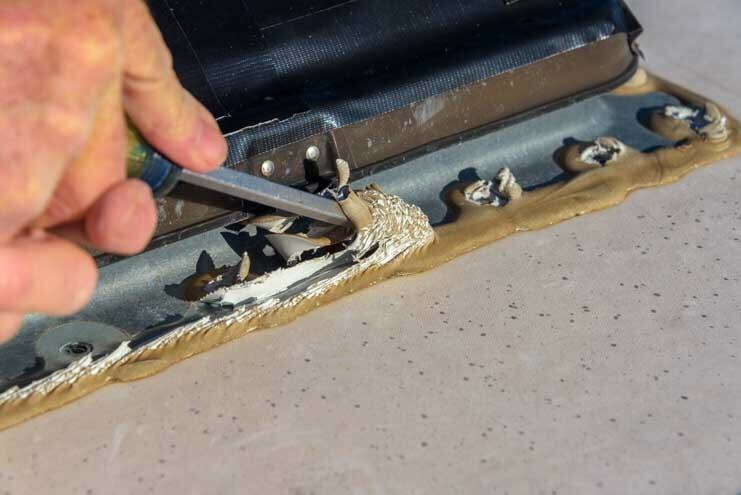 Scrape the Dicor Lap Sealant off the flange so the RV roof vent can be removed. The old RV roof vent was now ready to be pulled off of the roof all together. However, the wires for its 12 volt fan were still attached, so he clipped those off with diagonal cutting pliers. The old RV roof vent is ready to be removed except for the 12 volt fan wires. Cut the wires leaving plenty of wire remaining for the new RV roof installation. At last the old RV roof vent was completely removed leaving just the gaping hole into our shower stall below. Ready for the new RV roof vent. The next step was to prep the new RV roof vent for installation. 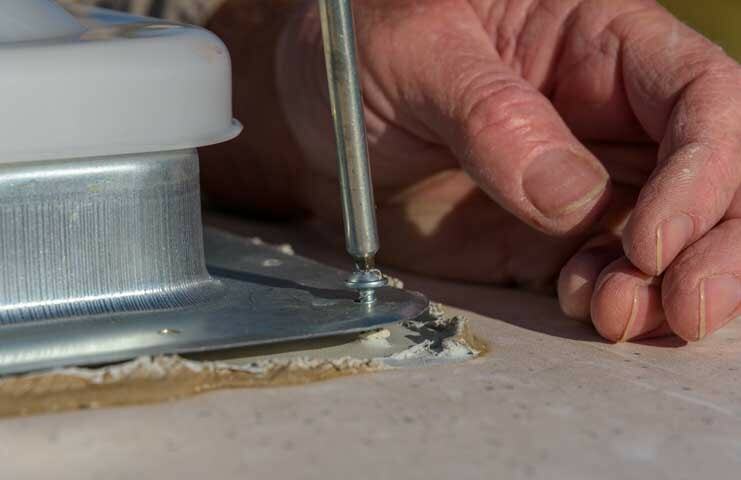 Mark unrolled some putty tape, which is sticky on both sides, and pressed it onto the bottom side of the flange of the new RV roof vent. Then he cut it to the proper length and peeled off the protective strip to expose the sticky part. 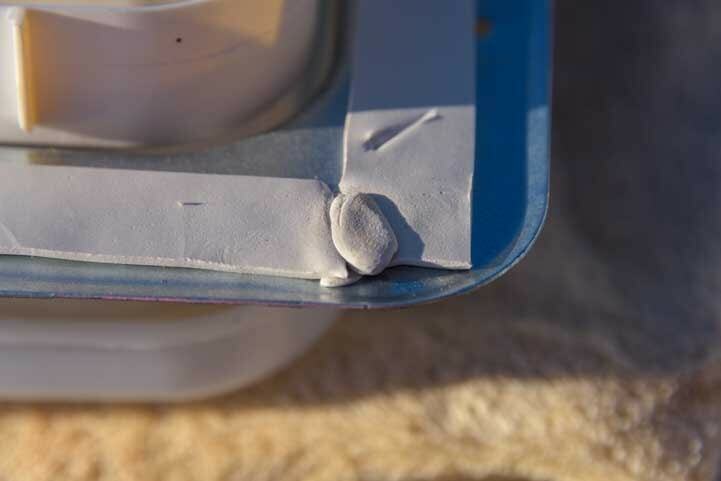 Place strips of putty tape on the bottom side of the flanges on the roof vent. This is double sided sticky tape. 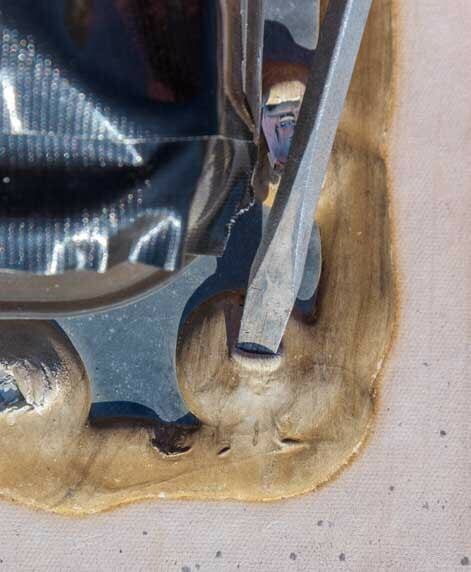 Remove the protective strip to expose the sticky side of the putty tape. At the end there was a tiny gap in one corner. 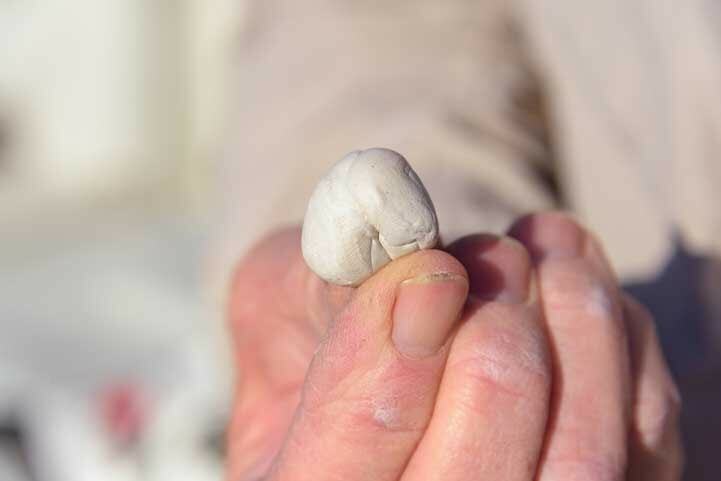 He rolled a small bit of the putty tape into a ball and pressed it into the gap. If you end up with a gap, ball up a little putty tape and press it in the gap. 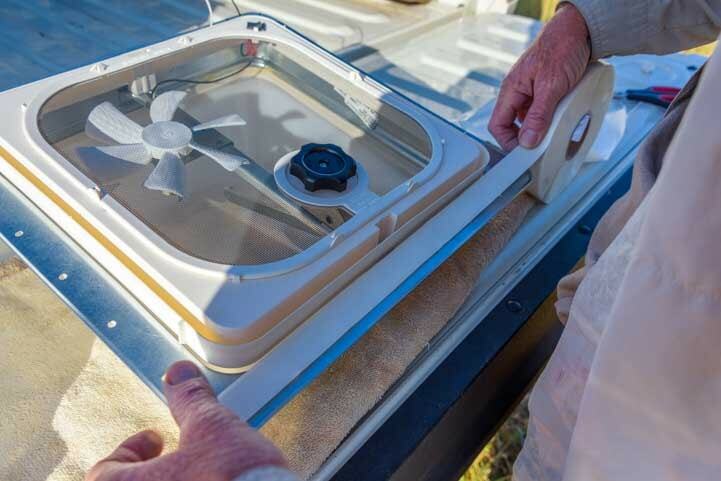 One of the interesting things about these RV roof vents is that the lids are flexible. Our old ones were heavily scraped from going under low hanging branches (as you can see in the first pictures of the broken vents near the top of this article), and they are designed to flex when something presses on them. 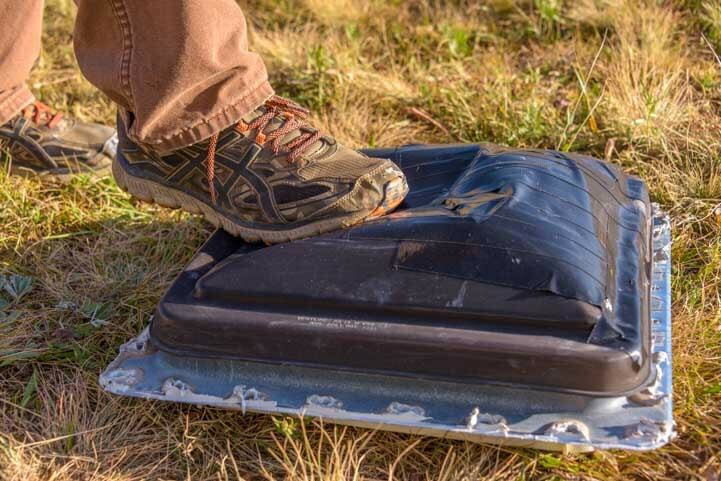 We didn’t want to demonstrate this with the new RV roof vents, but Mark pushed his shoe into the old vent so you could see. Obviously, the lid is weakened by the taped up holes, but it still has huge amount of flex to it. 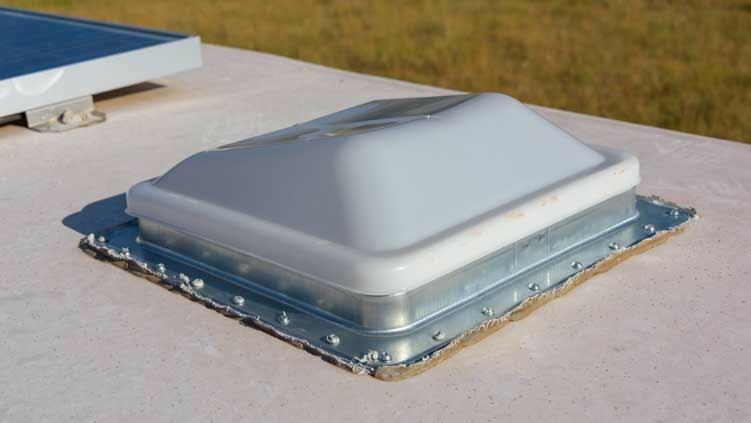 The dome lids on these RV roof vents are very flexible which helps when you hit low hanging branches. The next task was to get the RV roof vent installed on our trailer roof. We often pass things up to and down from the roof via the slide-out next to our front steps. This is much easier than climbing the ladder with one hand while holding something in the other. The new RV roof vent goes up on the roof. 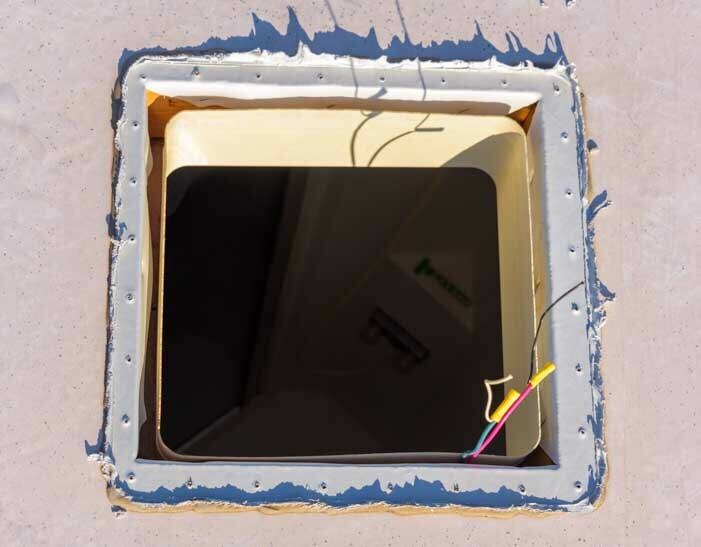 The Ventline RV roof vents had embossed labels showing how to orient them on the roof. The idea is to install the RV roof vent so it opens to the rear of the RV. That way, if you accidentally leave it open and drive off, the hinges won’t be fighting 65 mph winds on the highway that could rip the lid off. 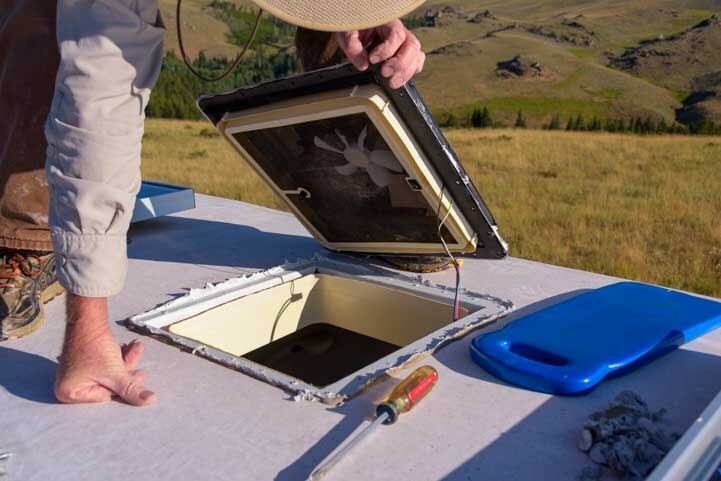 Be sure to orient the RV roof vent so it opens towards the back of the rig. It says “Vehicle Front” with an arrow. You may need to feel around to find the lettering! The new RV roof vent is in position. 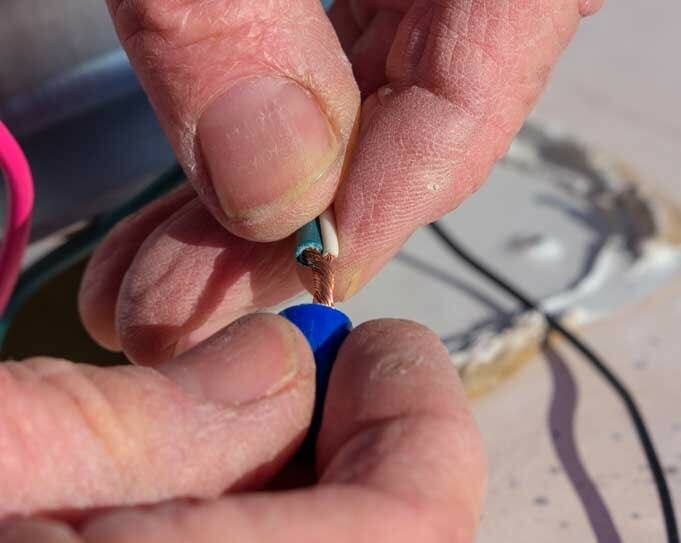 Before securing the RV roof vent in place, Mark wired up the 12 volt fan. 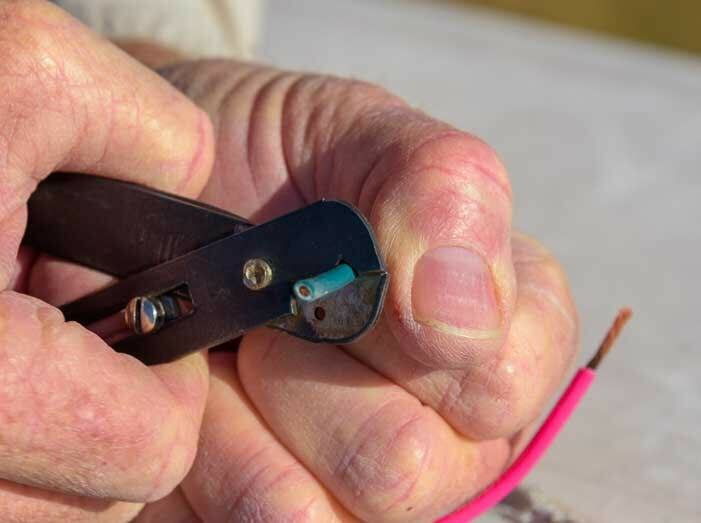 First he made a note of which color pairs had been wired together before and then cut off the crimp-on barrel connectors from each pair of wires. 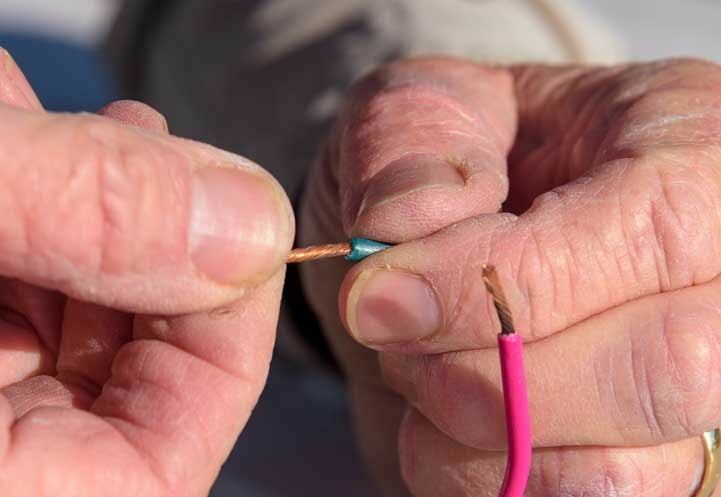 Then he used wire strippers to strip off a little bit of the outer casing of each wire to reveal the copper strands inside. Some errant strands were sticking out of the group so he he twisted all the copper strands together. Note how the fan is wired, remove the existing barrel connectors and strip the casing from the wires. Twist all the strands so no stray ones stick out. After doing this to all four wires he twisted the two pairs of wires together and screwed on new wire nuts. Twist the pairs of wires together and screw on the wire nut. At this point he turned on the 12 volt fan just to be sure that it not only was wired correctly but also rotated in the right direction to exhaust air out of the RV. 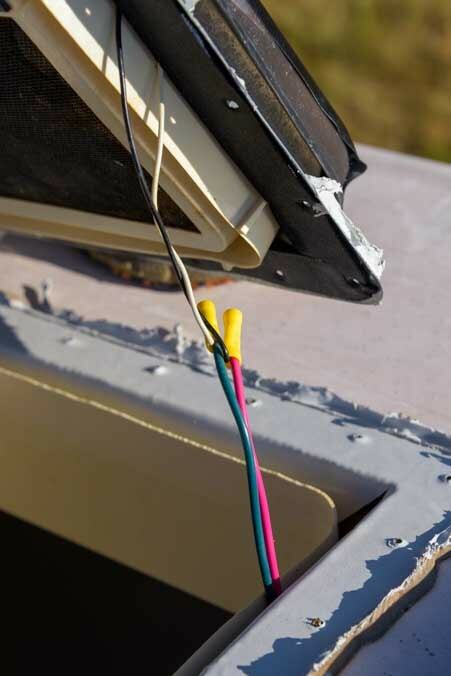 If he’d reversed the pairs of wires by accident, the fan would have run backwards, forcing air into the RV instead of exhausting it out. Test the fan to be sure it turns on and spins in the right direction. 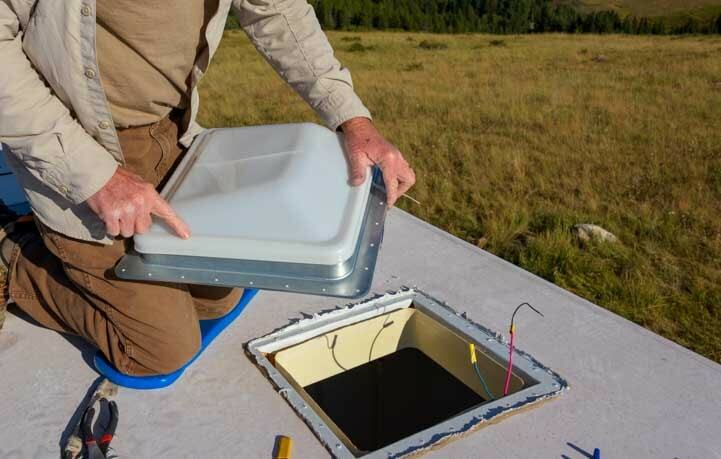 Then he tucked the wires in and closed the lid so he could screw it onto the RV roof. 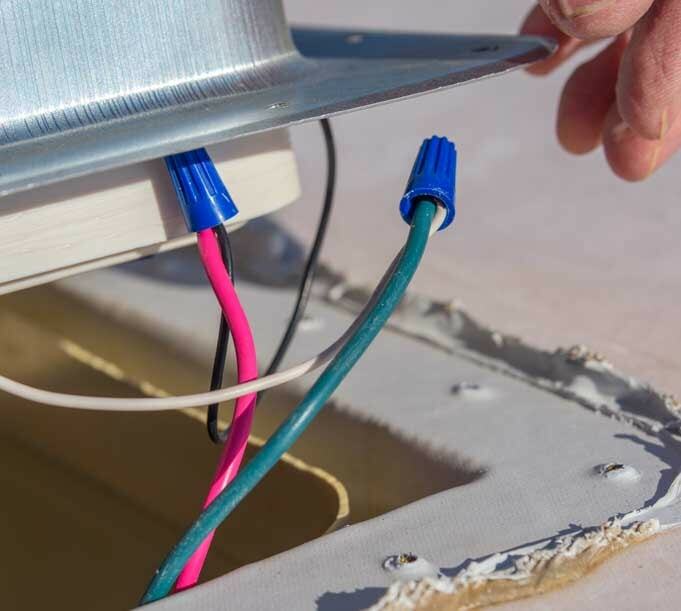 Then tuck the wires in and position the RV roof vent so the screw holes line up. 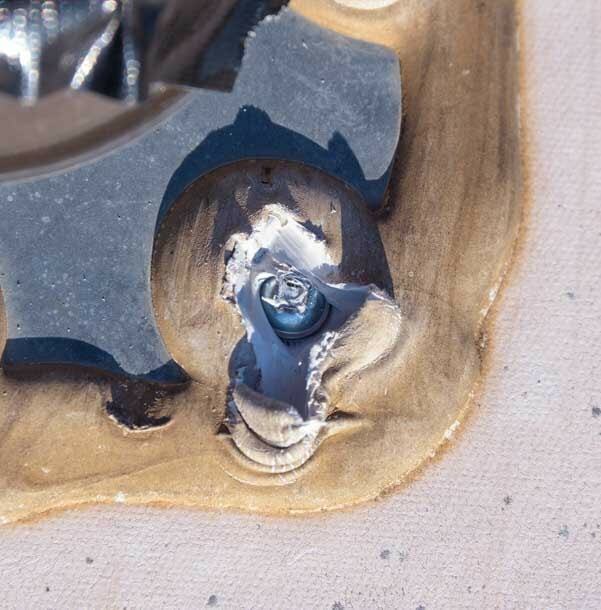 Using the #2 square bit on his cordless drill, he screwed down the four corner screws first. Screw in the four corners first. 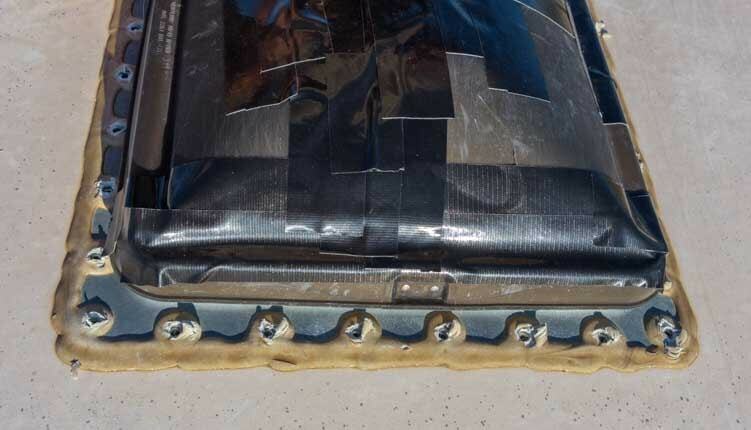 Then, to ensure the RV roof vent would seal evenly on all sides, he placed all the screws in their positions around the edges of the vent and screwed them in using a star pattern in the same way that lug nuts get tightened when changing a tire. After placing all the screws in the holes, use a star pattern to screw them in evenly. The next task was to cover all the screws with a thick layer of Dicor Lap Sealant. 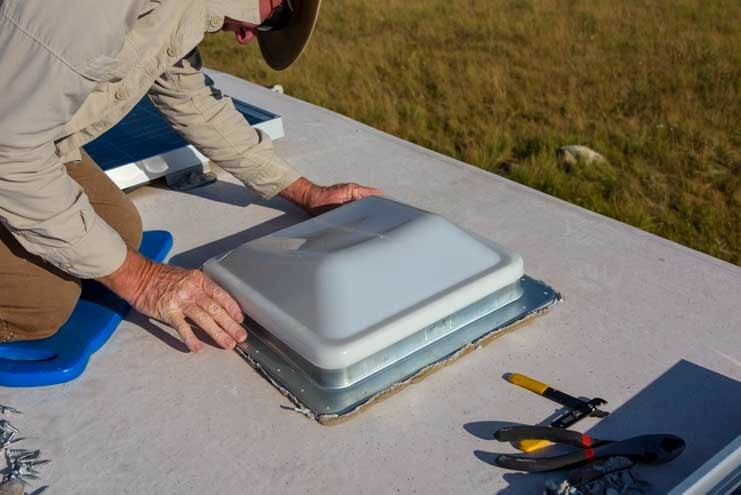 Mark had tackled this project in the early morning so he wouldn’t have to sweat it out on the RV roof at midday, but this meant the Lap Sealant was still quite cold and wouldn’t flow well. So, he took a break and left the tubes of Lap Sealant out in the sun to warm up for a while. Dicor Lap Sealant has to flow, so make sure it is warm enough that it will flow smoothly. 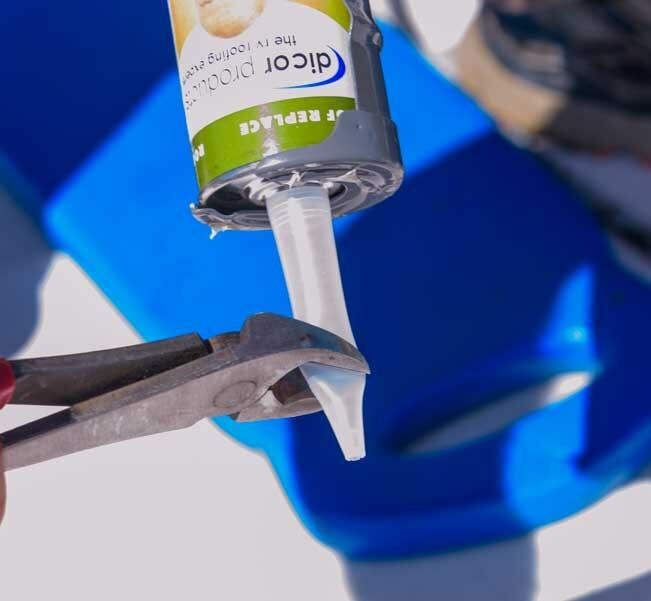 When the Lap Sealant was finally warm enough to flow, he clipped off the end of a Dicor Lap Sealant tube and set it in his caulk gun. He wryly joked with me that if you don’t invest in a quality caulk gun at the outset, you’ll keep throwing them out until you do! 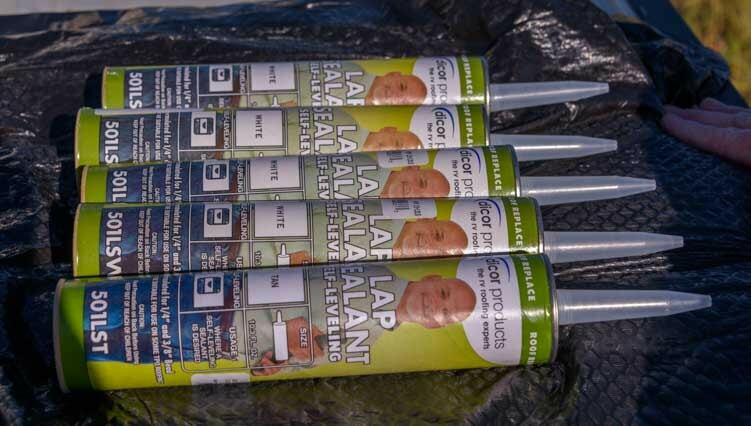 Cut the end off the Lap Sealant tube and place it in the caulk gun. Then he flowed the Lap Sealant along the edges of the RV roof vent flange, flowing a little over each screw head as he went. It took almost two tubes of Dicor Lap Sealant per RV roof vent. Flow the Lap Sealant along the flange and over each screw head. And Ta Da — he was finished! This installation project took about 45 minutes per roof vent. 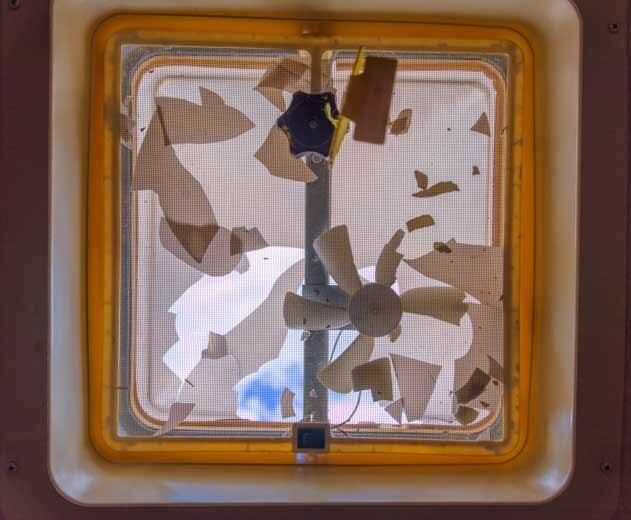 Our old RV roof vents had been installed at the NuWa factory in 2007 when our trailer was built, and they had worked flawlessly right up until this hail storm in 2018. 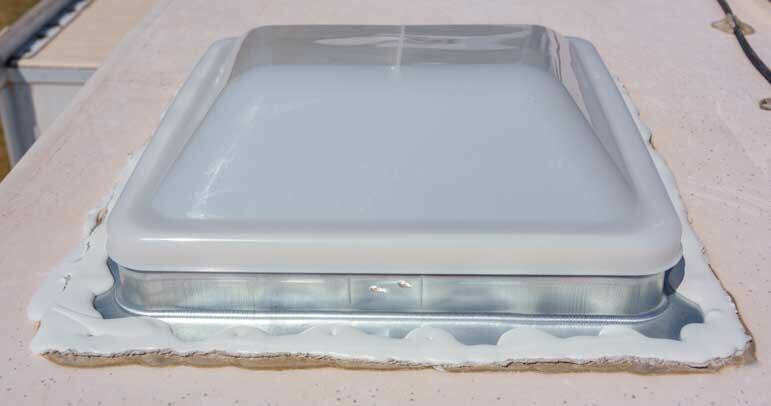 We were intrigued to discover that the old RV roof vents had been tinted a dark shade. The new ones were pure white, and what a difference that made inside! The first time I used the toilet room I opened the door and wondered why the light was on because it was so bright! 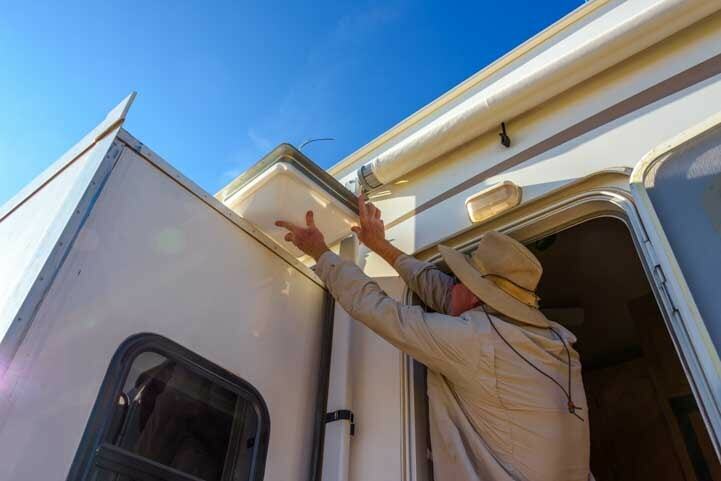 These lighter colored RV roof vents may let in a lot more heat, but vent insulators can help with that on the hottest days. One RV roof vent finished and one to go. After that, time for a beer! Mark did some other RV roof repairs while he was up there, but I’ll save those projects for a future article! Rigid cordless drill & impact driver kit with battery & radio – We got the kit and love the cordless drill, impact driver & radio too! 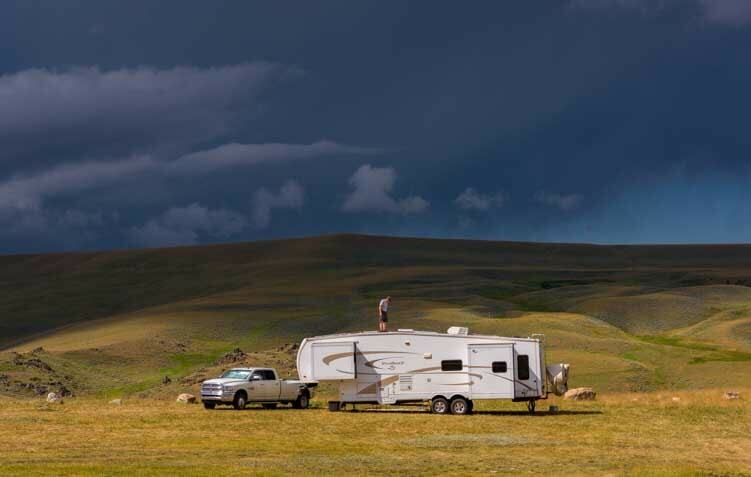 A Mobile RV Service Directory – in a Free App! B&W Companion OEM Fifth Wheel Hitch Installation – Easy! Edge Evolution CS Tuner Review – Peak Truck Performance! How to Put DEF (Diesel Exhaust Fluid) in a Truck & Which is Cheapest? How To STAY WARM in an RV – Survival Tips for Winter RVing! RV / Marine Battery Charging – Solar & Shore Power Combined! What are the Most Important Features in a Full-time Fifth Wheel Trailer?! This entry was posted in RV & Boat Projects & Upgrades and tagged New, Non-Travel, RV Tech Tips, RV Tech Tips Trailer, RV Technical Topics by Roads Less Traveled. Bookmark the permalink. Nice…but I came very close to not reading this article because I do not have an RV….but my curiosity about how Mark would get the job done and your help with the camera got my interest! You guys take some great photos for close up work and Mark really knows his business. AND, you had some great scenery shots as well. Thanks! You’ve got to get an RV, that’s all there is to it!! Thanks for reading this even though it had just a few scenery shots. Those storms were so beautiful. BTW Mark says he flies by the seat of his pants, but I know better!! 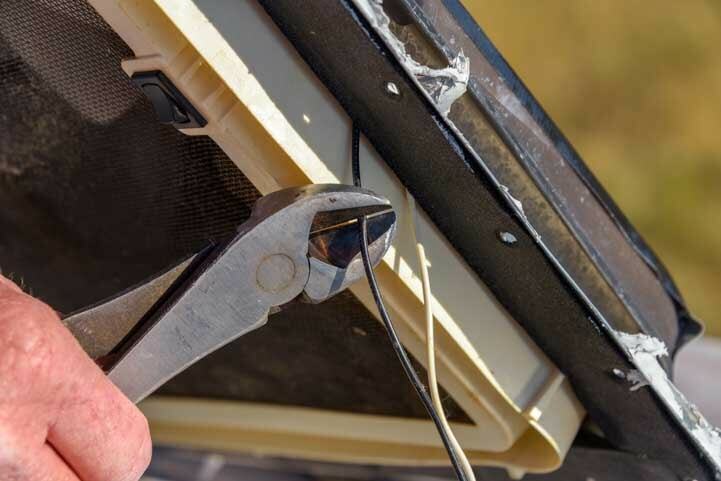 Very helpful fix for the roof vents … our RV is outside in the mountains of Colorado where in addition to hail we have the damage to plastic caused by higher UV. We installed the streamlined roof vent covers, which not only protect from hail, but allow you to have the vents open during most rain … especially helpful over our fantastic fan vents which will automatically close with rain, but that may lead to a very stuffy environment during Summer showers. Excellent tip, Richard. 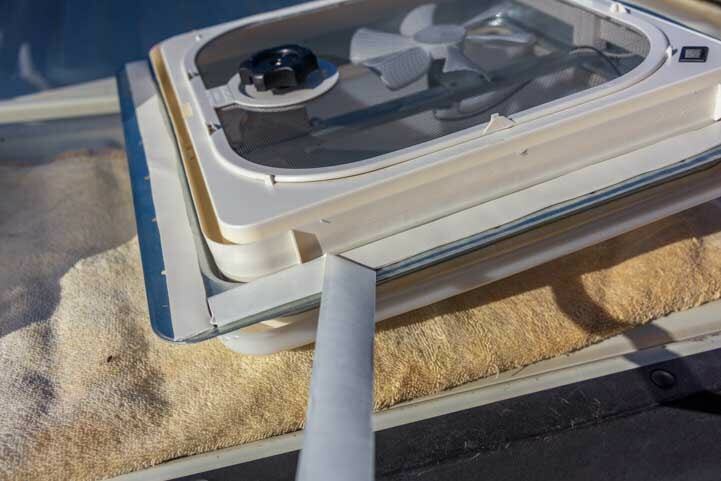 For curious readers, various types of RV roof vent covers are here. Thanks, Mike. I try to think of folks like me when I write these tech posts. Lots of our readers can skip over the simple steps, but there are those among us who appreciate all the details since we didn’t grow up working on car engines in the garage! You and your wife will love full-timing, and living in a toy hauler will be a lot of fun. Thanks for reading and dropping us a line!! Wow, ballistic hail! That’s really some serious ice. Glad the solar panels didn’t get hurt, great repair write up too. Thanks, Steve! We were sooooo lucky that the solar panels survived okay. That tempered glass on them is pretty strong. We were also super lucky our truck was with us in town!!! Another great post full of useful information which is presented very effectively! Thanks for sharing. Our pleasure, Jeff. We’re very fortunate that Mark can do these things in his sleep and I get a kick out of following his every move and writing about what he does. I hope you never get hailed on with anything bigger than a pea, but if you do, perhaps this post will help out! Thanks for all your great videos and photography! I have covers over both my hatches that allow operation in rain, windy conditions (to help avoid hatch being blow off) and while driving. Fantastic Vent has a video which shows virtually no airflow reduction when using their covers. There is no guarantee that hail won’t break thru the cover and then thru the hatch, but it is an extra layer of protection. I was wondering why you don’t use these? You are welcome, Dan, and thanks for letting us know that you appreciate our various online goodies. Those hatch covers seem pretty cool. We don’t have them because our trailer didn’t come with them and we haven’t felt inspired to buy and install them. 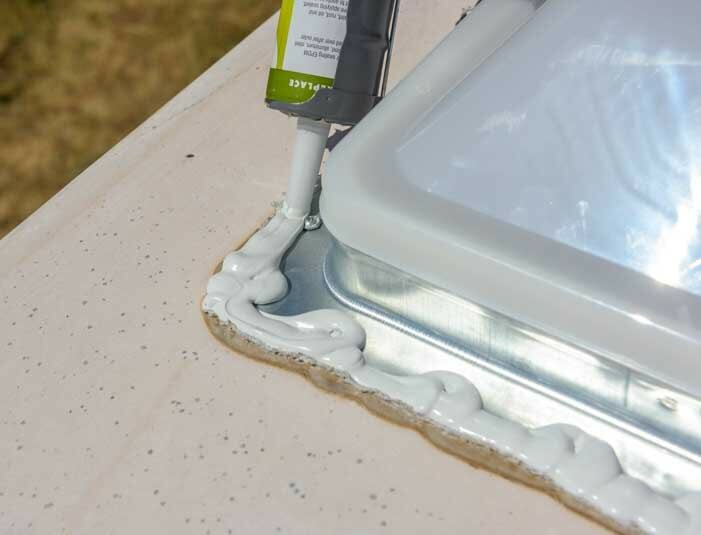 We like to keep our trailer as light inside as possible, and our roof gets scraped by low hanging branches all the time (we replaced our gutter spouts countless times and finally gave up on bothering with that any more). Our roof vents were fine for over a decade and they probably were quite brittle and thin from UVs so were more vulnerable to hail damage than they might have been when the trailer was new. Thanks for reading! BTW my initial reply should have been “thanks for the posts and photography”, not videos and photography. I don’t think I have seen videos on your site, and your posts are great! Great info, Dan. Thanks! Our rig is about 12′ 9″ tall at the highest point (air conditioner) which is lower than most modern full-time fifth wheels. But we scrape all the time anyway!! I was wondering when you mentioned the videos, and Mark thought maybe you meant the Camping World video about us that we posted a few months ago. We do have some videos posted, but they are generally time-lapse videos of things like sunrises, sunsets, clouds moving and the Milky Way crossing over our rig during an all night long time-lapse. We haven’t done any “How To” videos about RVing. Happy trails!! Hey, Em & M! Yikes is right! Good job on the repair! Hoping our paths might cross in the next few weeks. We’ll be heading west from Sioux Falls on August 15 on a slow course to San Diego. That would be fun! Hope to catch you guys!! gotta love it when a storm blows in from nowhere.. the plastic looks like it as done for anyway.. brittle and way to dark for the bathroom. Seeing how small the fan is why not replace with a fanatic fan or maxi air type to move more air. same size and effort to put in. that what i did no airstream when fan when out. We thought about replacing them with Fantastic Fans or Maxxair, but they are a lot more expensive and weren’t readily available. Also, the little fans have worked just fine for over a decade and we’d rather spend the money on a new lens for our cameras! Thanks for another great post, Emily! 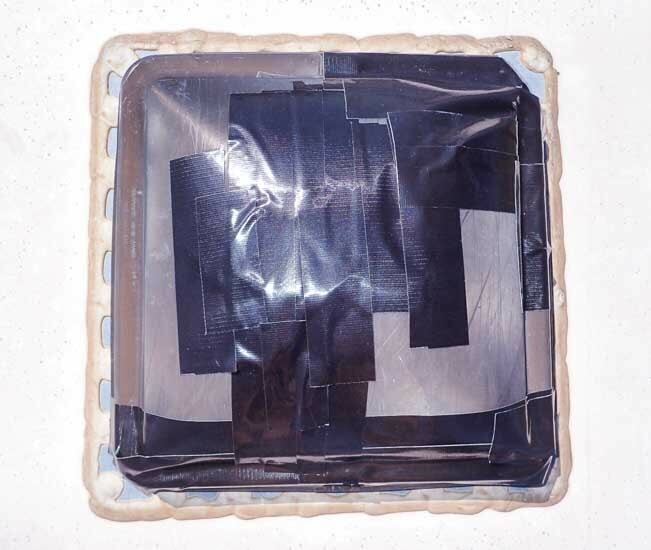 My husband and I have not run into a situation that required replacing a vent (and hope we never do), but he appreciated the detailed description of the process as well as your photos – excellent info to have in our back pockets. Speaking of photos, the storms in your photos look quite impressive, and those “big skies” out west at least allow you to see one rolling in. In many places here in the northeast, between the mountains and the trees, the storms can sneak up on you before you know you’re about to get nailed. Travel safely! And happy belly rubs to Buddy! I’m glad to know your hubby appreciated the step-by-step, Mary, but I sure hope he never needs to refer back to this post! You’re absolutely right about storms sneaking up on you in places where you can’t get a big view of the sky. We used to watch Nor’Easters roll in off the ocean in New England, but as soon as you get away from the coast there the trees often take over the view of the sky! 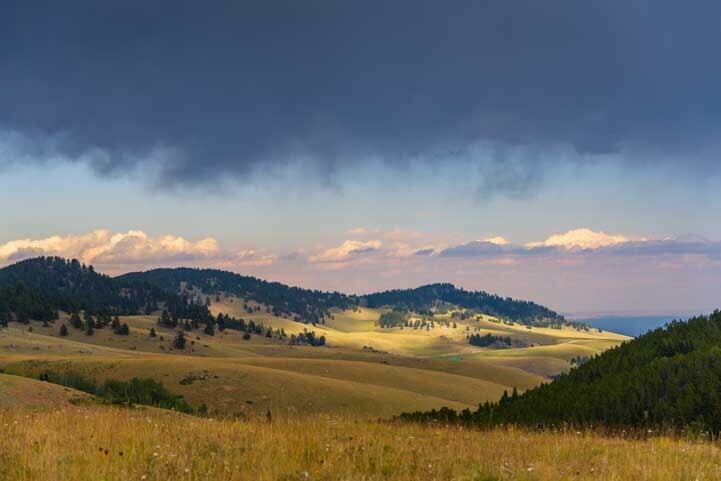 Out west we often have expansive views, and it is quite a thrill to see storms rolling across the landscape. Happy travels — Buddy says thanks for the belly rubs! Thanks for the detailed article with photos! I was in the same area several weeks last summer, and again this June, and noticed all the pock-marked cars in the Rapid City parking lots. Luckily I’ve avoided serious hail on my rig in 2 years of full-timing out west. I left my awning half-open at Devils Tower this year while on a day outing (no severe weather in forecast), and returned to a squall that had my awning trying to climb over the top! Luckily no serious damage, but is another example of the shifty nature of the weather in the area. Will remember your post in case I encounter a nasty hailstorm. Hopefully you won’t experience a hail storm with hail stones quite as large as this, Eric. Smaller hail isn’t a problem, although it sounds really scary on an RV roof! You never know with mountain weather and coastal weather. Things can change so quickly. But in in the end it’s all part of the adventure. Happy travels and thanks for reading! 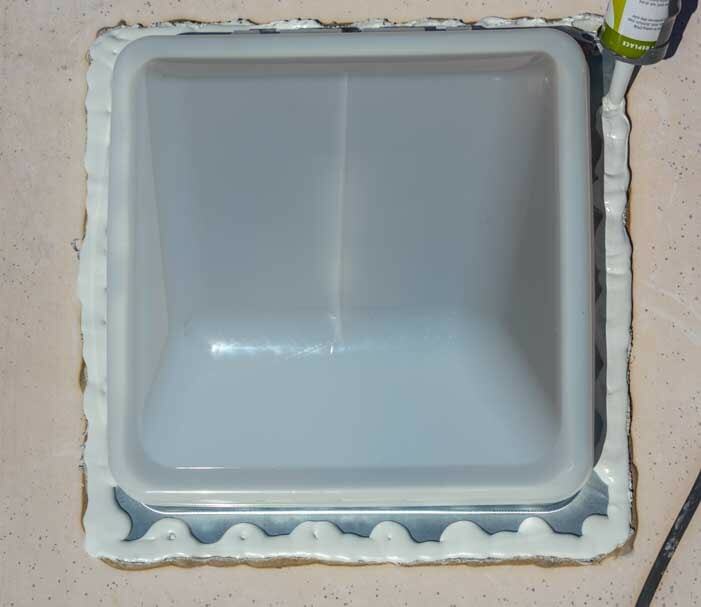 Good post but I’m wondering why Mark didn’t remove the old caulking before setting the new cover in place? It wasn’t necessary and would be a lot of extra work and we may get a new roof anyway. The important thing was to make a good seal with the new lap sealant. Yup- hail does that. Itaska State Park Minnesota- hail came in the middle of the night so hard couldn’t leave to get to a shelter or pull in the porch awning. All vent covers shattered, awning shredded and tow car totally dented. Not to mention sleep was impossible. Sounded like we were being shaken in a beer can filled with rocks. Yikes!! That is crazy scary!! At least YOU are okay!! You mentioned that you often scrape low-hanging branches on your RV roof. I am assuming your roof is rubber. Have you ever ripped a hole in your rubber roof? I boondock almost exclusively and go into spots where I scrape branches on my RV’s rubber roof. I worry about ripping a hole in the rubber fabric.